Gain the clarity, confidence and knowledge needed to effortlessly attract a flood of new patients! It’s no secret that without new patients, your practice is dead in the water. Of all the pressures within your practice, the ONE thing that can do the heaviest lifting and relieve those pressures is a pre-meditated, unbreakable, automatic new patient generation formula. Jay uncovers strategies, secrets and shortcuts that require minimal time, effort, testing and money. They also attract the MAXIMUM number of new patients in the SHORTEST amount of time and will radically increase your cash flow and decrease your anxiety level within the next 30 days. 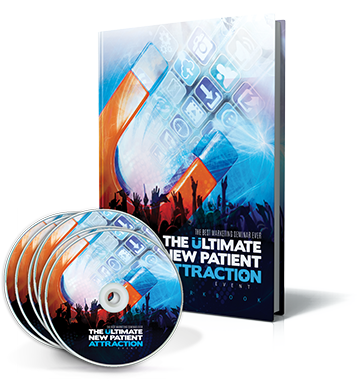 Jay has been in the New Patient Generation Business for over 20 years… now’s your chance to learn from the most prolific and profitable new patient EXPERT in history! Become more persuasive and influential in your marketing and with your patients so that you get more new patients, and more compliance! Gain insights into both the high-level strategy work and day-to-day implementation that goes into creating holistic digital marketing programs that drive results. Eliminate everything that’s no longer working in New Patient marketing so you can SAVE your money and stop wasting it, put your hands in the most recent marketing tools, strategies, tips, tricks and systems that are all working right now in THIS economy with patients in THIS era of dentistry. Put yourself in a position of POWER going into the next 18-36 months so you have a virtual crystal ball when it comes to new patient attraction. You’ll be ready and prepared for every new trend on the horizon and you’ll beat EVERY competitor to the punch. It’s your Marketing Director’s job to make your Practice famous, and you need to be ok with that! Learn how to avoid complacency, how to segment your audience and how to create appropriate messaging for your market so that you can draw attention to your practice and increase new patients! Understand the critical elements needed for online marketing success, Jay’s Top 10 Marketing Allocation Ideas and how your body language will help you to build rapport with patients which will result in instant influence! Learn how to set yourself up as an authority in your community and dominate your competition. Gain a better understanding of branding your practice, referral marketing, lead generation marketing, public relations and the importance of the media. Learn how to make marketing decisions based on your goals – not based on your current revenue. Success and growth doesn’t end at mastering marketing techniques… you also need to know how to get your patients to follow-through with treatment once you’ve gotten them through your doors. Learn all the tips, tricks and strategies needed to maximize the effectiveness of your marketing to drive revenue! We have had a 55% increase in New Patients since attending TBMSE this year! I am revitalized and re-focused and I really want to make 2018 the year where we get our human capital in line and efficient. It gave me more information that I need in order to market in the right way, how to target specific audiences and help the overall growth of our Practice.